A year in Paris… since World War II, countless American students have been lured by that vision—and been transformed by their sojourn in the City of Light. 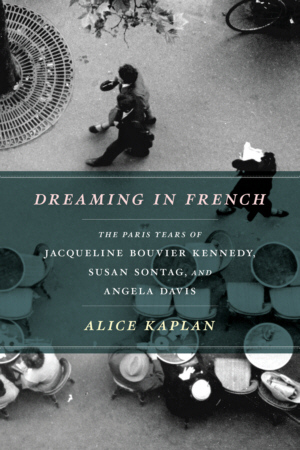 Dreaming in French tells three stories of that experience, and how it changed the lives of three extraordinary American women. All three women would go on to become icons, key figures in American cultural, intellectual, and political life, but when they embarked for France, they were young, little-known, uncertain about their future, and drawn to the culture, sophistication, and drama that only Paris could offer. Yet their backgrounds and their dreams couldn’t have been more different. Jacqueline Bouvier was a twenty-year-old debutante, a Catholic girl from a wealthy East Coast family. Susan Sontag was twenty-four, a precocious Jewish intellectual from a North Hollywood family of modest means, and Paris was a refuge from motherhood, a failing marriage, and graduate work in philosophy at Oxford. Angela Davis, a French major at Brandeis from a prominent African American family in Birmingham, Alabama, found herself the only black student in her year abroad program—in a summer when all the news from Birmingham was of unprecedented racial violence. Kaplan takes readers into the lives, hopes, and ambitions of these young women, tracing their paths to Paris and tracking the discoveries, intellectual adventures, friendships, and loves that they found there. For all three women, France was far from a passing fancy; rather, Kaplan shows, the year abroad continued to influence them, a significant part of their intellectual and cultural makeup, for the rest of their lives. Jackie Kennedy carried her love of France to the White House and to her career as an editor , bringing her her cultural and linguistic fluency to everything from art and diplomacy to fashion and historic restoration—to the extent that many, including Jackie herself, worried that she might seem “too French.” Sontag found in France a model for the life of the mind that she was determined to lead; the intellectual world she observed from afar during that first year in Paris inspired her most important work and remained a key influence—to be grappled with, explored, and transcended —the rest of her life. Davis, meanwhile, found that her Parisian vantage strengthened her sense of political exile from racism at home and brought a sense of solidarity with the burgeoning Algerian independence movement. For her, Paris was a city of political commitment, activism, and militancy, qualities that would deeply inform her own revolutionary agenda and soon make her a hero to the French writers she had once studied. Kaplan, whose own junior year abroad played a prominent role in her classic memoir, French Lessons, spins these three quite different stories into one evocative biography, brimming with the ferment and yearnings of youth and shot through with the knowledge of how a single year—and a magical city—can change a whole life. No one who has ever dreamed of Paris should miss it.